For users of the COMSOL Server™ product, version 5.3 of the COMSOL® software brings several updates to better monitor usage. Updates include more information on running applications, a usage log file, cluster administration settings, and license and product information, to name a few. View all of the COMSOL Server™ updates here. You can now see more information about your apps that are running on COMSOL Server™ than in previous versions of the software. This includes showing solver progress and messages from separate applications in the COMSOL Server™ user interface. For administrators and power users, the Monitor page now provides a Servers table, where all processes are listed per connected COMSOL Server™ instance along with associated information. Also provided is a Sessions table, where all running application sessions from all COMSOL Server™ instances are listed together along with other appropriate information. Progress is also shown while applications are launching. 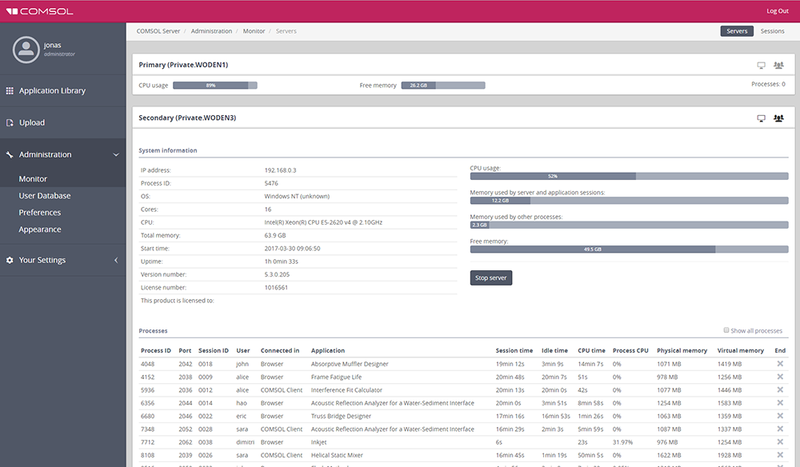 The COMSOL Server™ user interface showing the status and other information of two applications being run in the Application Library, where one of them is also computing. The COMSOL Server™ user interface showing the status and other information of two applications being run in the Application Library, where one of them is also computing. 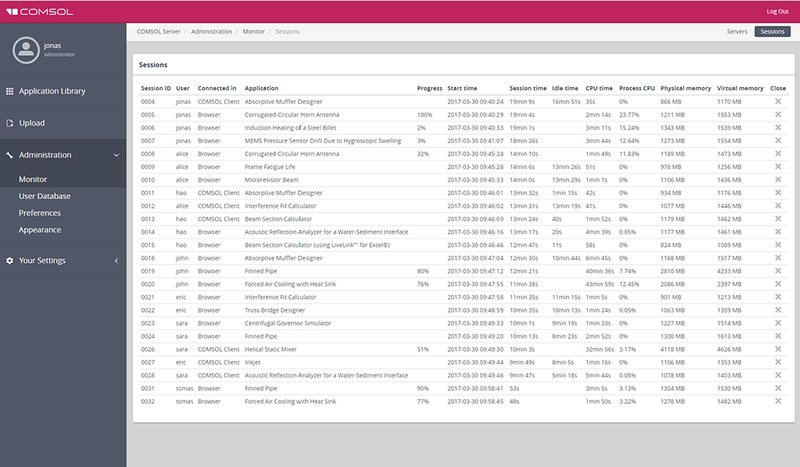 The COMSOL Server™ user interface showing the Servers table on the Monitor page. This shows the system information and a list of all processes that are being accessed and the apps that they are running. 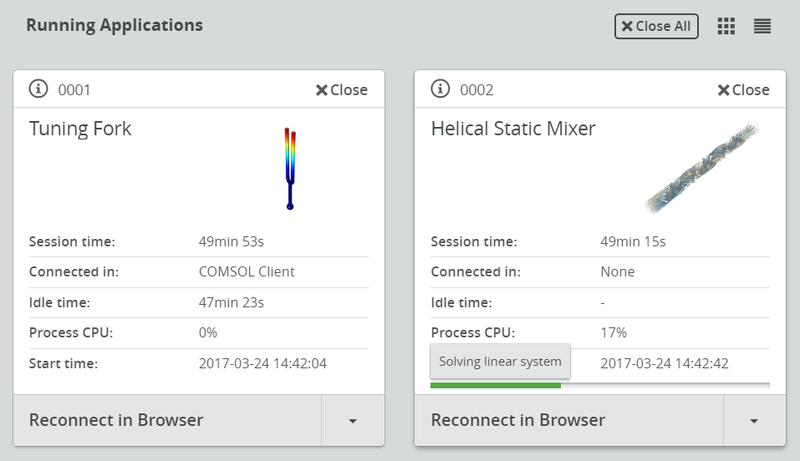 The COMSOL Server™ user interface showing the Sessions table on the Monitor page. This shows a list of all sessions that have been launched and are being run along with further information about the respective sessions. Preferences are now automatically copied from previous installations of COMSOL Server™, so that you can retain your custom settings in new installations. This also includes preferences, appearance settings, uploaded applications, and user files. A log of the applications that are run on COMSOL Server™ is saved as a text file and can be processed by shell scripts or loaded into the Microsoft® Excel® spreadsheet software and other software for further analysis. Collected data includes: username, server name, application name, application filename, start time, end time, session time, CPU time, and the number of cores. The CPU time is counted per core, which means that if an app uses 100% of two cores for 1 minute, then the CPU time is 2 minutes, but the session time is only 1 minute. When an application is idle, it uses almost no CPU time. For example, if you run an app for 10 minutes and it solves in 1 minute while fully using two cores and is more or less idle for the remainder of the session, then its CPU time will be 2 minutes and the session time will be 10 minutes. In this log file from the Microsoft® Excel® spreadsheet software, you can see which users are using which apps, the duration of a session (session time), the number of cores used, and the CPU time per session. In this log file from the Microsoft® Excel® spreadsheet software, you can see which users are using which apps, the duration of a session (session time), the number of cores used, and the CPU time per session. COMSOL Server™ now fully supports running from behind a reverse proxy, such as NGINX or Apache mod_proxy, for which suitable configuration examples are included. Using a reverse proxy is convenient for hosting COMSOL Server™ under its own path on a common domain, such as http://example.com/comsolserver, or to use an SSL-configured reverse proxy to provide a secure connection for COMSOL Server™ users. When COMSOL Server™ is configured with a secure connection, you can log into COMSOL Server™ from the COMSOL Client for Windows® using Windows® Authentication, Active Directory®, or LDAP. There are now preferences in COMSOL Server™ for configuring the Cluster Computing and Remote Computing settings used by applications. This makes it easier to create cluster-aware applications that can be run on any COMSOL Server™ installation where a cluster is configured. 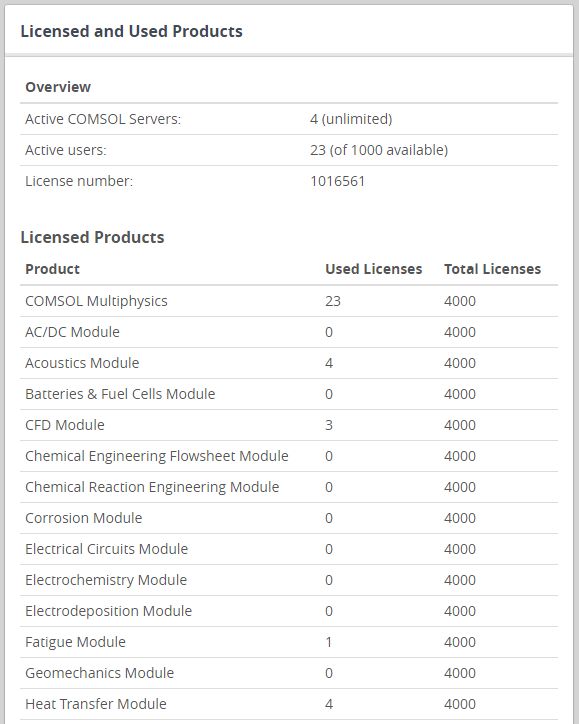 A new COMSOL Server™ page collects information about the current license and product usage. Find this page in the About COMSOL Server™ window, located in the lower-right corner of the COMSOL Server™ web interface. To reduce CPU load, COMSOL Server™ now reuses the processes that run applications for multiple sessions. 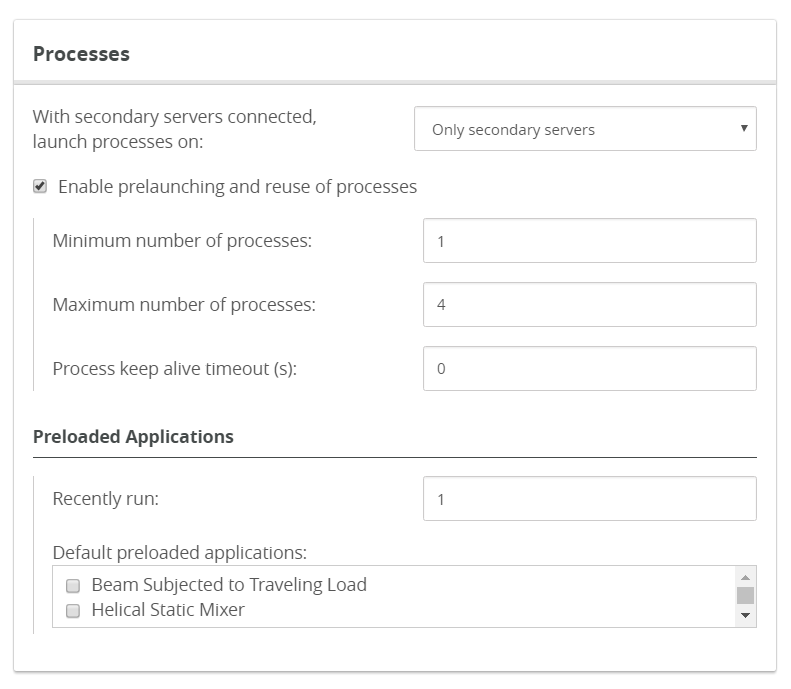 The settings for prelaunching can be configured with a minimum and maximum number of processes per COMSOL Server™ instance, depending on the expected peak usage. A new preference allows you to launch processes both on the primary and secondary servers for installations where there is only a single or few secondary COMSOL Server™ instances. 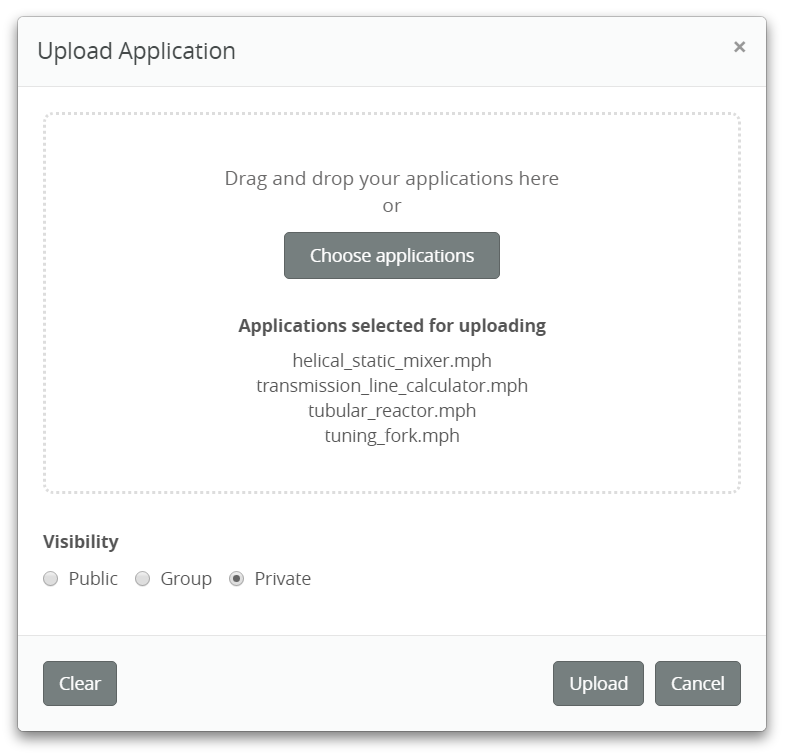 Several applications can now be uploaded at the same time, by dragging and dropping multiple files into the loading window.